If you've been tracking studies on climate change, you already know our blue planet is entering a period of transition. Some experts put it more bluntly, suggesting we're just a few disaster telethons away from a series of calamities that will alter our lives permanently. Food and water shortages, mega-storms, wildfires, more frequent 9.0 earthquakes and powerful solar flares by 2013 have been predicted by leading geologists, solar physicists and atmospheric scientists. 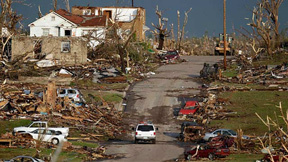 An EF-5 tornado hit the south side of Joplin, Missouri on 5/22/11. In an OpEd published in the Washington Post on August 3rd, the father of climate change study, NASA's Jim Hansen confessed that his earlier hair-raising projection about global warming was, if anything, overly optimistic. "In a new analysis of the past six decades of global temperatures, which will be published Monday, my colleagues and I have revealed a stunning increase in the frequency of extremely hot summers, with deeply troubling ramifications for not only our future but also for our present." Aug-July 2010: Russian wildfires kill 50,000 and halt grain exports as a moisture-bearing jet stream bypasses that country and delivers catastrophic flooding instead to Pakistan. Dec 2010: Over 350,000 square miles of Western Australia were flooded, including Brisbane, after record rainfall in a country whose eastern half still bakes from a decade-long drought. Jan 2011: Flash floods and mudslides in Brazil leave over 600 dead. March 2011: An earthquake and tsunami devastate northern Japan, triggering a nuclear meltdown. April-May 2011: The worst tornado season in U.S. history levels multiple cities in the south and midwest, killing over 600. Flooding in Montana and along the Mississippi River has left millions of acres and several towns submerged. Summer 2011: Heat wave and severe drought in Texas and Oklahoma January 2012: Europe, Northern Africa and even Afghanistan are engulfed in an unprecedented cold spell, while North America experiences an unseasonably warm winter and Western Australia floods again. Summer 2011: The contiguous United States is experiencing its worst drought since the Dust Bowl, with mega-wildfires raging across the west and federal disaster areas declared across the midwest agricultural belt. And while archeologists specializing in the Maya culture still insist the so-called Long Count calendar has no connection to an end-times scenario playing out soon, the Mayans themselves no longer share that optimism. Back in 2005, Hurricane Stan ravaged Central America just after a 5.8 earthquake struck the region, an event which in turn jumpstarted El Salvador's Llamatepec volcano, dormant for the last century. Dozens of villages in the Guatemalan highlands vanished under mudslides caused by the hurricane, with a death toll exceeding that of Katrina. 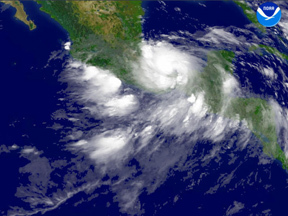 Then, in May of 2010 the first tropical storm of the season destroyed a dozen more villages. An earthquake in Haiti just four months earlier logged a staggering 212,000 fatalities, followed by an 8.8 temblor in Chile a few weeks later. Since then, hurricanes have repeatedly pounded the region each summer. On the other side of the world, the end of 2004 brought the strongest earthquake in recorded history toSoutheast Asia. Lasting three minutes, the 9.1 mega-thruster caused a momentary wobble in the Earth's rotation. The subsequent tsunami killed over a quarter million people in 11 countries. According to the World Glacier Monitoring Service, the planet's ice sheets are melting so fast, many will vanish by mid-century. NASA's Jet Propulsion Lab reported in January 2008 that the rate of ice melt in the Antarctic had increased 75 percent in the last decade. Two years later, an iceberg the size of Manhattan was seen cruising past Australia. Glacier melt is serious business, since it means the loss of key fresh water supplies. Parts of Asia, Africa. South and North America depend on high-altitude glaciers. It's no wonder that some are now predicting hundreds of thousands, if not millions of climate refugees on the move in the 21st century. The steamy climate also appears to be expanding malaria zones along the Equator. 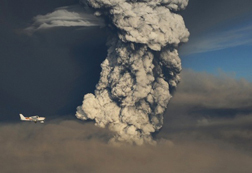 Olafur Sigurjonsson/Reuters Grimsvotn, the latest Icelandic volcano to blow. Others scientists predict ice-free summers at the North Pole as early as 2012. Three years ago, Oceanographers Katey Walter and Jeffrey Chanton warned in a study that highly combustible methane gas locked beneath Siberian permafrost and the ocean floor will be released into the atmosphere, thanks to rising temperatures. Fossil fuels aren't solely to blame for a warmer planet, either. Distracted by the debate over carbon credits, most people remain misinformed about the clearcutting still underway in the world's rainforests. Even though these ecosystems are critical in converting much of the planet's CO2 gases into oxygen, massive logging operations in Indonesia, Africa and South America persist. Altogether, they're producing an estimated 25 percent of CO2 emissions roasting the atmosphere. And those trees aren't coming back anytime soon. CNN reported in its Planet in Peril series in 2008 that 5,500 square miles of rainforest are clipped annually in the Amazon basin alone. The Greenhouse Effect, by the way, refers to CO2 trapped in the atmosphere, which prevent the Sun's heat from reflecting back into space as infrared rays. Moreover, since a dark ocean surface absorbs heat, while white ice repels it, scientists like James Lovelock say the continued loss of sea ice has created a positive feedback loop, accelerating the rate of polar melt. Longer summers and higher temperatures have sparked the mega-wildfires that continue to plague Europe and North America. On nearly every continent, summers now last an average of three to six weeks longer than in previous centuries. Forestry experts in California and Montana have documented permanent damage to the topsoil as a result of those fires. They say few seedlings are sprouting from the ashes. And the Earth is losing its oxygen-filtering capability from another source as well. The rise in sea temperatures is destroying marine plankton. An essential link in the food chain, planktom also has the distinction of transforming as much as half of all CO2 back into oxygen. Yet oceanographers have tallied estimated 400 dead zones in recent years - areas depleted of oxygen, plankton and sea life. (And they were only looking in estuaries and coastal waters!) The apparent reason: Acidification of the oceans causes the "bleaching" of coral reefs and an inability of sea creatures to form shells. Responding to all these dire developments, the National Academy of Sciences has said it's considering a plan to artificially induce cooling by depositing massive quantities of sulfur into the stratosphere. The new science of "geo-engineering" also proposes to lower carbon dioxide levels by injecting fertiilizer into ocean dead zones. The fertilizer is expected to stimulate massive plankton blooms. Several years ago, the movie The Day After Tomorrow dramatized how an ice age might get jumpstarted under certain conditions. The huge amounts of fresh water now entering the oceans from the Arctic and Antarctic zones may be disrupting what's called the thermohaline circulation of the oceans. 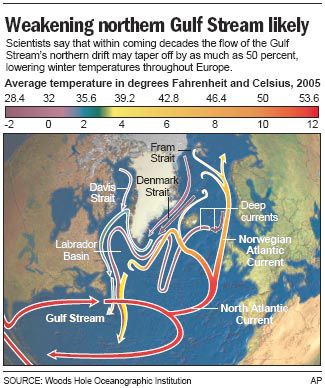 The Gulf Stream and its counterparts in other parts of the world are responsible for moving equatorial water out towards the poles. Conversely, the cold water at the higher altitudes rides the same conveyors back down to the Equator. This circulation is largely responsible for the temperate climates enjoyed by much of the human population. Here's the rub: Since warm water rises and travels close to the sea surface, the colder, salt-laden water at the poles normally moves along a route that's deeper down in the sea. But fresh water doesn't contain any salt, and therefore collides with the warm water, causing the thermohaline conveyor to grind to a halt. That leaves the warm water in the tropics getting even warmer, and the cold water at the poles growing colder. Scientists theorize that this scenario may one day generate a mini-ice age in northern Europe. The hotter water in the gulf, meanwhile, would conceivably spawn more intense hurricanes. "Climate change is here — and worse than we thought." By James Hansen Washington Post 8/3/12. "Drought Is the Worst in 56 Years." Associated Press 7/17/12. "7 Tipping Points That Could Transform Earth." Wired.com 12/23/09. "Global Warming Could Cool North America in a Few Decades?" National Geographic 9/14/09. "Methane Releases From Arctic Shelf May Be Much Larger and Faster Than Anticipated." National Science Foundation 3/4/10. "Big Freeze Plunged Europe Into Ice Age in Months." Science Daily 11/30/09. "Climate Change and Trace Gases." (PDF) Hansen, James, et al. Philosophical Transactions of the Royal Society 2007. "Why Gaia is wreaking revenge on man's abuse of the environment." The Independent, U.K. 1/16/06. "Imagining the Unthinkable." (PDF) 2005 Pentagon study of global warming's impact. By Peter Schwartz and Doug Randall. "The Greenland Ice Sheet in a Changing Climate." (PDF) 2009 Report of the Arctic Council's SWIPA project (Snow,Water, Ice and Permafrost in the Arctic).
" Polar Ice Melt Is Accelerating." BBC News Dec. 2008. "Ocean Dead Zones Growing - May Be Linked to Warming." National Geographic 5/1/08. "Has globalisation made us more catastrophe-prone?" By Andrew Marshall. Reuters 4/27/09. Red Tide Blooms. Discovery News 3/20/09. Revenge of Gaia (2006) by James Lovelock. History Channel: The Seven Signs of Apocalypse, Nostradamus 2012, Global Warning, The Universe series (Magnetic Storm), How the Earth was Made series (America's Ice Age, Yellowstone, Ring of Fire, Mt. Saint Helens), The Crumbling of America. National Geographic Channel: New shows this year include Stormageddon and Tornado Swarm of 2011. Also, "X-Ray Earth," which tracks geologists as they search for clues that major planetary changes are in the works. Weather Channel: "It Could Happen Tomorrow," a series that examines the impact of potential mega-disasters throughout the United States. Episodes include an earthquake on the New Madrid Fault, an eruption on Mt. Rainier, and flash flooding in Boulder, Colorado. "Earth 2100". Two-hour fictional drama from ABC News charts the collapse of civilization through the lifetime of a public health nurse.